A rechargeable USB battery pack is the perfect solution to power LabRadar. 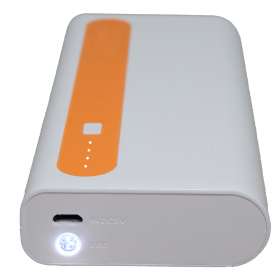 While the system works great on AA batteries, you can extend the shooting day with this 10,000 mAh rechargeable power bank. It is supplied with heavy duty 3M Dual Lock reusable fastening tape to attach the power pack to your Labradar. A USB cable is supplied to connect to your LabRadar. The power pack is also compatible with cell phones and tablets. Rechargeable up to 500 times. 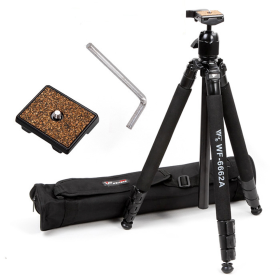 Labradar has added a super portable tripod mount to their line of products. This tripod will support your Labradar unit. It is adjustable from 9.25 inches high to 11 inches high. 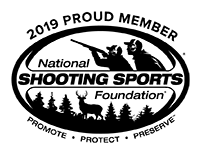 LabRadar is the world's newest technology in obtaining projectile velocities of Rifles, Shotguns (slugs only), Handguns, Pellet Guns, BB Guns, Bow & Arrows, Crossbows, Paintball. 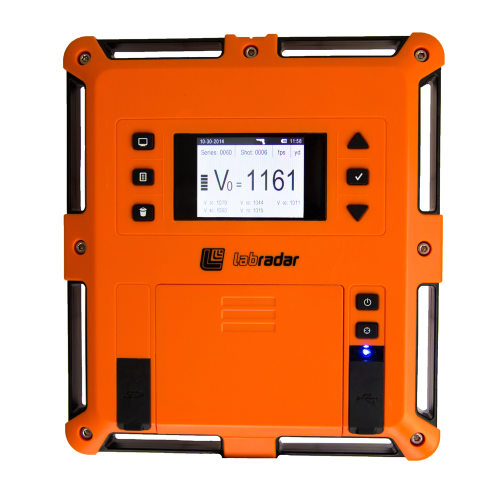 Doppler Radar is the most precise method of measuring velocities available. Its accuracy is not dependant on light conditions or being exactly parallel to photo electric sensors resulting in false readings. No shooting through a small confined area. No dealing with optimal lighting conditions. No stopping the firing line to set up and take down equipment. Place LabRadar beside the shooter, point towards the target and you're ready to go. If you're not in the center of the radar beam is the accuracy diminished? Infinition, the company that created and manufactures the LabRadar has been designing and manufacturing high end instrumentation radars for more than a decade. Infinition's high end radars are used daily by professionals at various Research Centers, Ballistic Laboratories and Proving Grounds around the world. The LabRadar has been built from the same technology inside Infinition's high end radars and brings that technology in the hands of the shooters and hunters, providing an accurate and reliable way to measure the velocity of various projectiles. Can the LabRadar be used with bows and crossbows? Yes, when used in the Doppler mode the arrow acts as the trigger when it enters the radar beam. This is generally 6-10 feet downrange. It will continue to track the arrow for approximately 60 yards. When in the Trigger Mode an adapter can be used on the bow to communicate with LabRadar. The adapter will trigger the radar in the release of the arrow. LabRadar will report the muzzle velocity and up to five other velocities at the distances that you select in increments of one (1). You will be able to select these distances prior to shooting. You can select feet, yards, meters, etc. Velocities can also be reported in metric and standard values. Currently LabRadar will obtain velocities from most Slug type projectiles. At this time it will not read multiple pellet projectiles. Will LabRdar pick up shot from other shooters? 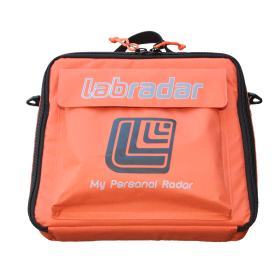 LabRadar accuracy will not be affected by other shots being fired into your radar beam. Part of the technology built into the system allows it to determine if the shot came from very near the radar unit or if it came in from another location. Since the radar tracking is only active for a fraction of a second it is nearly impossible for you to receive a velocity from another shooter nearby. Your unit also has an adjustment in it to "turn off" most gunshots that are nearby, yet allow your shot to operate the unit. In rare cases your unit may trigger on another shooters muzzle blast. If this occurs you can easily delete that shot from your data. The same words 10 times better than my Caldwell chronograph did really help me figure out my load for my 6.5 Creedmoor. I have had the opportunity to use this unit several times since receiving it, and I am entirely pleased with it's simplicity in set-up and use. No more cold range to get the chronograph set-up, no more ungainly wires and sky screens. This product changes the game, not only does it provide a great deal more information than a traditional chronograph it much easier to set-up and use.